Peter is quick, daring, and full of mischief–and like all boys, he loves to play, though his games often end in blood. His eyes are sparkling gold, and when he graces you with his smile you are his friend for life, but his promised land is “not” Neverland. There is “always” more to lose. Accompanying Peter to a gray and ravished island that was once a lush, enchanted paradise, Nick finds himself unwittingly recruited for a war that has raged for centuries–one where he must learn to fight or die among the “Devils,” Peter’s savage tribe of lost and stolen children. The cover is intriguing, illustrated by the Author himself. The summary isn’t the greatest but I’m a sucker for hooks and personally, I thought the ‘There is “always” more to lose’ was a pretty good one. In the middle of the book there are some colored illustrations of a few characters (none of Nick unfortunately) and every chapter had a drawing accompanying it which was a really nice touch. As someone who’s interested in drawing and character design, I really appreciated the pieces of work. Now the actual story… I got pulled in right from the get-go and I definitely had a hard time putting it down. My mind was all like “Sleep be damned! Go Sam! Go to Avalon (this novel’s Neverland)! Join the Devils and become clan!”. Well… I couldn’t refuse and when the book came to an end, unfortunately, my adventure there did as well. Sigh. This re-working of the Peter Pan story is obviously a little darker. There are different point of views throughout the book, mostly Peter and Nick, but it’s nice to see where each characters’ motivation for their actions are coming from and it isn’t confusing or hard to keep track of who’s who and what happening. Their emotions and thoughts were so very real and human it got me thinking about how I would react, what would motivate me? Because of the different point of views, I kept changing my mind about how I felt for each character, some times I was angry at Peter because Nick was angry at him other times I felt sympathy. There were characters that I hated (coughleroycough) and characters that I really liked but couldn’t get to know because they weren’t the focus. The story line really flowed and weaved together nicely, there wasn’t a part I didn’t like, and I definitely didn’t feel as though some scenes dragged on like some other books leave me feeling. I actually have lot of lines that I enjoyed too. What?! Quotes?! I know. I know. I’ve never quoted here before but there’s a start for everything. I don’t know what it was about some of the lines but they seemed to just pull at my heart and make me feel something. I’ll took that as a sign of liking it. Final verdict? I love this novel. It’s definitely one of my favorites and definitely the best one I’ve read this year. I can’t wait to go for a second and third read! Actually, I’m nervous that I loved this book so much that I won’t be able to get pulled into whatever I read next. I gave this a 4.5 cupcakes with extra extra sprinkles and icing. I definitely recommend this book but I’ll admit it might not be for everyone. It’s an entertaining read, the writing isn’t over the top but simple and matches the feel of the story. If you’ve read this what did you think? I’m really curious to know! Especially if you’ve read Barrie’s Peter Pan in Kensington Gardens and Peter Pan and Wendy. ALSO. If you have read this and enjoyed it, what’s something you’d recommend to people who liked this? I need more books like this but I don’t know where to start hunting. 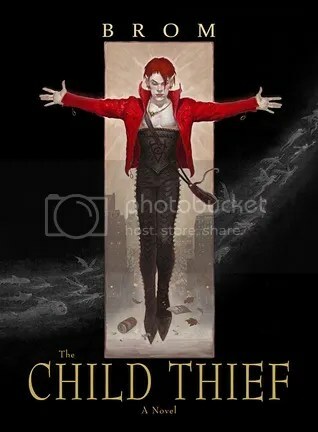 This entry was posted in 2012, Reviews and tagged Book Blog, Book Reviews, Books, Brom, Fantasy, Horror, literature, Peter Pan, Sam, The Child Thief, Words for Dessert by dreamingwithink. Bookmark the permalink.